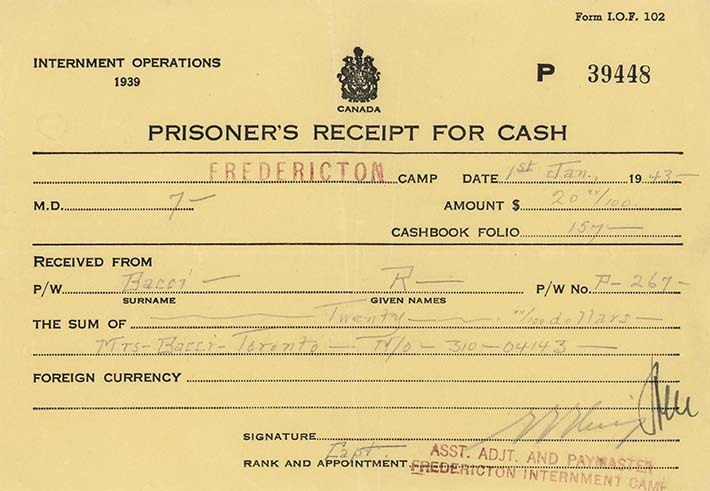 Prisoner's Receipt for Cash, Fredericton Internment Camp, Jan 1, 1943. The receipt is for $20.00. It is unclear if this receipt is for money Ruggero Bacci received from his wife or for money he sent to his wife. Internees who were under sixty years old did manual labour or vocational work. Others worked where they were needed. Internees were paid by the Canadian government 25 cents for a day’s work. Internees were not required by the authorities to work every day. In addition, internees could earn money informally by doing camp chores for others, like laundry. Those who were handy, also made things, like wood carvings, and sold them to other internees. Internees could also receive money from their families which would be credited to their camp accounts. This system is described by Mario Duliani in his book The City Without Women. Diuliani notes that money (paper and coins) was not permitted in camp. Instead, he describes a system where each internee had an account opened through the "Official Accountant". Against this account, the internee would be issued cardboard notes/chits valued at 5, 10, 25 cents and one dollar. This money could be used to purchase items from the camp canteen such as toothpaste and cigarettes. Some letters suggest that internees could also send money earned in camp to their families.